In 2018, the city government completed 31 life improvement projects with an investment of 11.19 billion yuan (US$1.65 billion) in 10 areas closely related to people's daily lives. Residents are reasonably satisfied with the city’s efforts to improve their lives over the past year, the government has said. In 2018, the city government completed 31 life improvement projects with an investment of 11.19 billion yuan (US$1.65 billion) in 10 areas closely related to people’s daily lives including care for the elderly, the environment, traffic conditions, sports facilities, waste recycling and cultural services. The satisfaction score, based on an online vote, official statistics and opinions from lawmakers and political advisors, reached 91.02, up 0.11 points from 2017. People were most satisfied with the project for an additional 1,003 “love relay stations” that provide resting places for outdoor workers, such as sanitation workers and express deliverymen. People were also happy that the government developed 89 jogging and walking paths, opened an additional 509 “love summer care” camps for primary school students, erected 81 new daily care centers for the elderly, built or renovated 72 sports fields, improved services at 4,500 neighborhood cultural venues and constructed 223.9 kilometers of greenway. Other highly-praised accomplishments included renovation of 10 million square meters of old houses, 31.06 million square meters of water supply facilities in suburban areas and 187,905 sewage treatment facilities for rural families. Among the life improvement projects accomplished in 2018, an extra 7,103 beds were added at senior care homes across the city, and another 1,194 beds were renovated for seniors with dementia, surpassing the goal of 7,000 and 1,000. Taking care of seniors with dementia requires professional skills and intensive nursing, which places great pressure on families, civil affairs officials said. Building a nursing care system targeting this group of the elderly is a highlight of the city’s senior care service facility development, according to a blueprint. The 1,194 beds were developed from existing beds, and they incorporate training and therapy functions. Aid and rehabilitation facilities have also been introduced. An area exclusively for seniors with cognitive disorders at Shanghai Yinkang Senior Care Home in Hongkou District has 76 beds. Known as “memory town,” it is the city’s first area exclusively designed for seniors with dementia. The area features a nostalgic environment with old broadcasts, thermoses, enamel cups, books and newspapers. 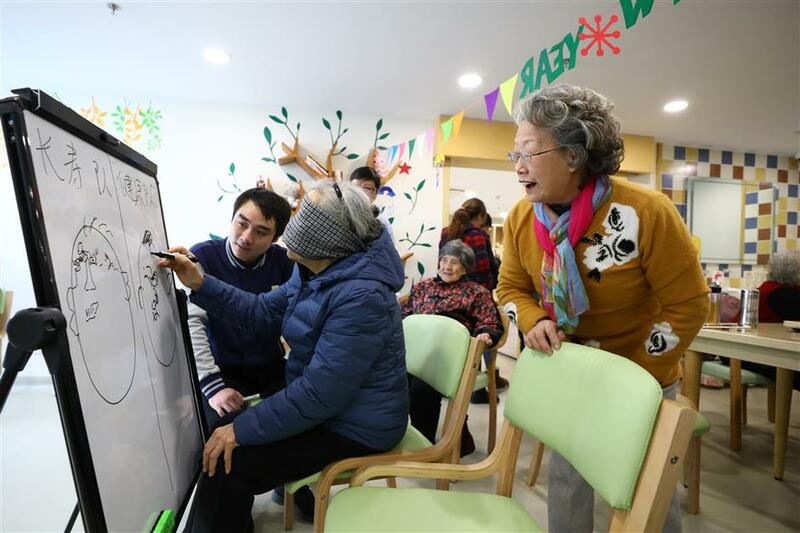 “We are creating a warm home for this group of seniors instead of a traditional senior care institute,” said Zhou Xin, deputy director of the senior care center, which has more than 300 senior residents. About 35 percent have cognitive disorders. In addition, 44 senior care centers in the city’s suburbs were upgraded with infrastructure renovated and facilities increased in 2018, and 81 senior day care service centers were built in the city, exceeding the targets of 40 and 80. The city started trialing an insurance system citywide from 2018 for senior citizens needing long-term nursing care who are covered by public medical insurance with nursing services paid for by the insurance fund. Through the year, nursing services for eligible seniors staying at home were provided 5.66 million times under the insurance system, compared with the target of 3 million. The number of people aged 60 or above totaled 4.84 million in the city at the end of 2017, accounting for 33.2 percent of permanent residents. In 2018, authorities opened 509 “love summer care” camps for primary school students, 25 community-based childcare centers and 1,003 “love relay stations” offering resting places to outdoor workers. Authorities also helped 8,602 jobless young people find employment or start their own business. There is a dire shortage of accessible and affordable childcare in Shanghai. 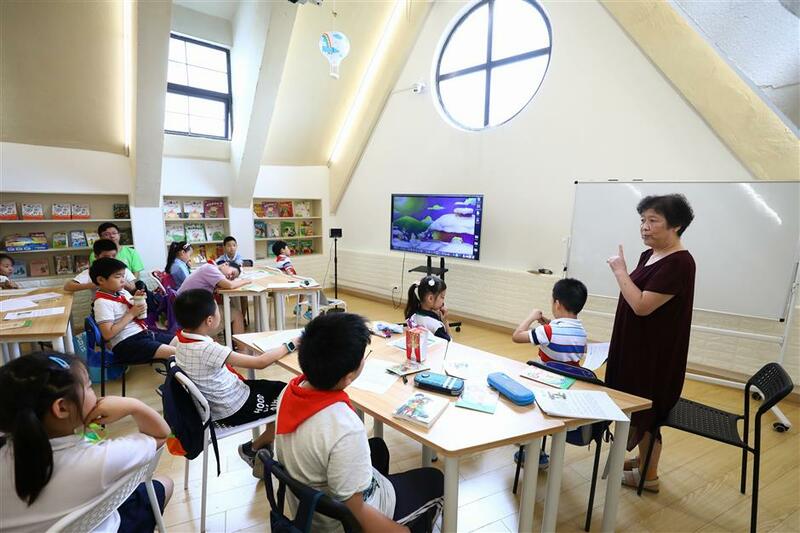 A survey conducted by the Shanghai Women’s Federation showed almost 90 percent of the 7,500 local families with children under three questioned said they needed childcare. But eight in 10 children are cared for by their grandparents — who don’t want the responsibility. This is the result of a lack of quality childcare facilities, and the high cost of hiring a nanny. To relive the burden of young working parents, authorities in 2017 initiated a program to open 20 community-based childcare facilities, accepting children aged between 2 and 3. In 2018, an additional 25 facilities opened. The facilities are still far from enough to meet the demand as a survey showed only one in five of the city’s estimated 100,000 children aged between 2 and 3 are in professional childcare. But it has proved a good start and is a success, said Xu Feng, president of the women’s federation. The facilities were built by the government and run by community groups. Strict standards were made to ensure the safety of children. 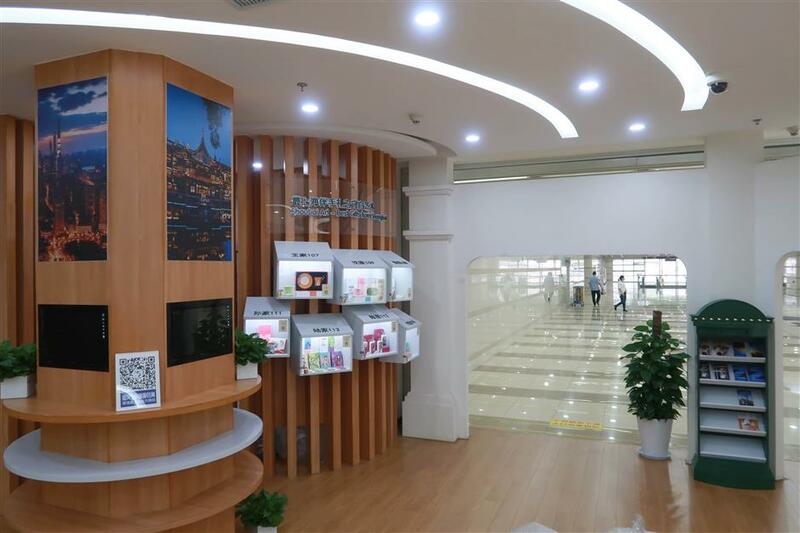 The DTD childcare facility in Hongqiao Town opened in May 2018. A local resident surnamed Li sent her 2-year-old son to the facility, which is just 15 minutes’ walk from home, in September 2018. Care during the two-month summer vacation is also a worry. To solve their concerns, the city launched “love summer care” camps in 2014, where pupils take classes, do homework and attend activities. The program has proved popular. In 2018, 509 new camps opened. To make the city “warm,” the government has built 1,003 “love relay stations” offering rest places for outdoor workers including sanitation workers, deliverymen and taxi drivers. In a room equipped with an air conditioner, they can have rest, drink water, have lunch and use the toilet. Tong Li, a sanitation worker in Huangpu District, starts work at 5am every day. 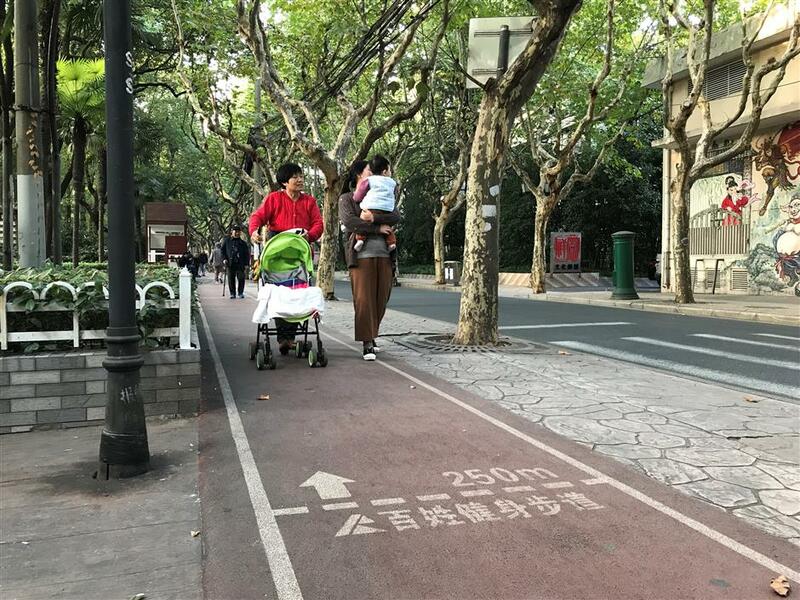 She has a 15-minute rest break so it is impossible for her to return to her team rest station on Weihai Road if she is cleaning on Chengdu Road N. The rest station has solved her problem. “These ‘love relay stations’ solve our difficulties. I can get some hot water, heat up a meal and enjoy a break in air-conditioning now,” said Tong. 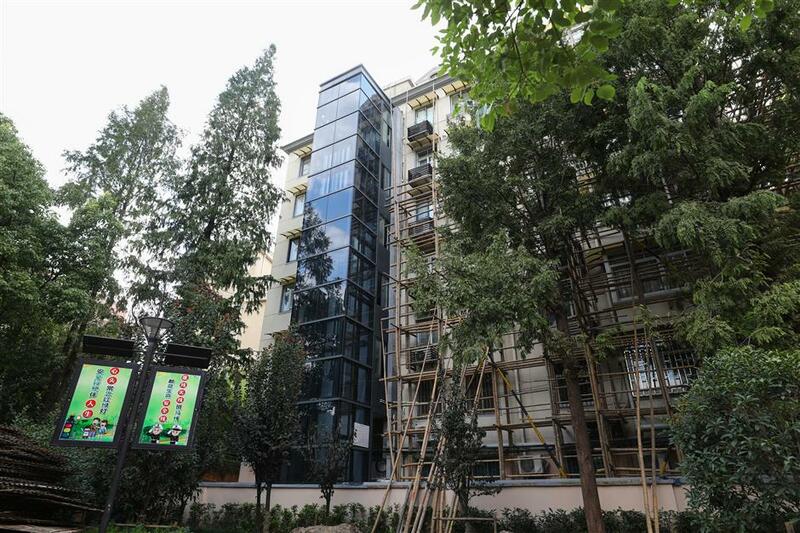 Elevators have been installed in an old residential building in Changning District. Across the city, old cramped houses are widespread. In 2018, 10 million square meters of housing was renovated. In some cases the existing apartments were repaired and upgraded by reinforcing the structure, and providing toilets and kitchens in every home. If the buildings are too dilapidated, they are demolished and new homes built. Residents move back to enjoy life in their “new homes” in areas where they have always lived. Pengsan in Jing’an District is an example. It is a typical old residential warren where thousands of people, many of them elderly, live in wretched conditions in moldering old buildings. The structures were built about 60 years ago without elevators and with shared toilets and kitchens. Two or three families shared one kitchen and as many as 10 shared a single toilet. But this has changed since the program to build new homes on old sites started in 2008. Over 10 years, 13 modern apartment blocks were built to replace the 25 decrepit ones, accommodating more than 850 families. The new apartments are self-contained, equipped with elevators and garages. In March 2018, more than 420 families received the keys for their new homes as the forth-phase renovation was completed. So far, most of them have moved in after interior decoration. The fifth-phase renovation, which covers nearly 900 families, started at the end of 2018. He Huizhen, 69, is very happy with the renovation. She had been living in cramped conditions for 60 years. Her mother-in-law lived in one room, while she and her husband lived in a jerry-built shelter in the yard. They now live comfortably in an apartment with two bedrooms, a kitchen and a toilet. 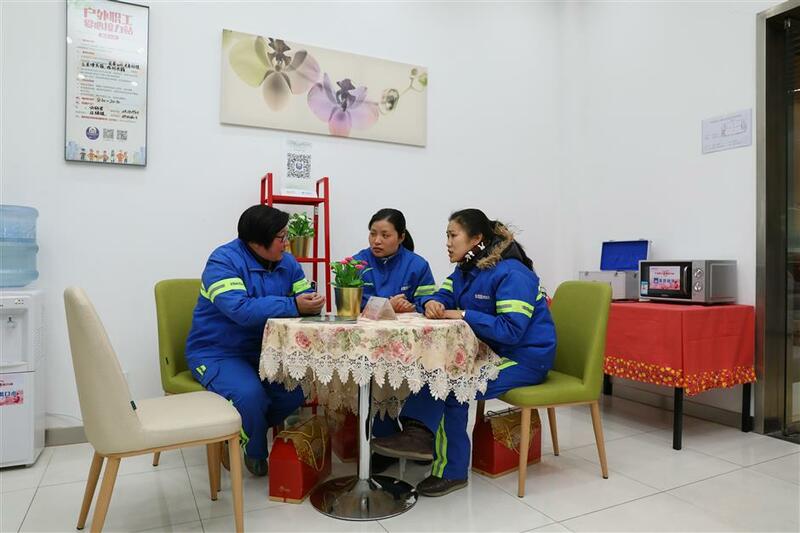 Domestic sewage treatment facility renovations for more than 180,000 households in the countryside were accomplished in 2018, compared with the target of 100,000 households. The households are in eight districts. By 2020, it is targeted that the domestic sewage treatment rate in the city’s countryside should reach over 75 percent. 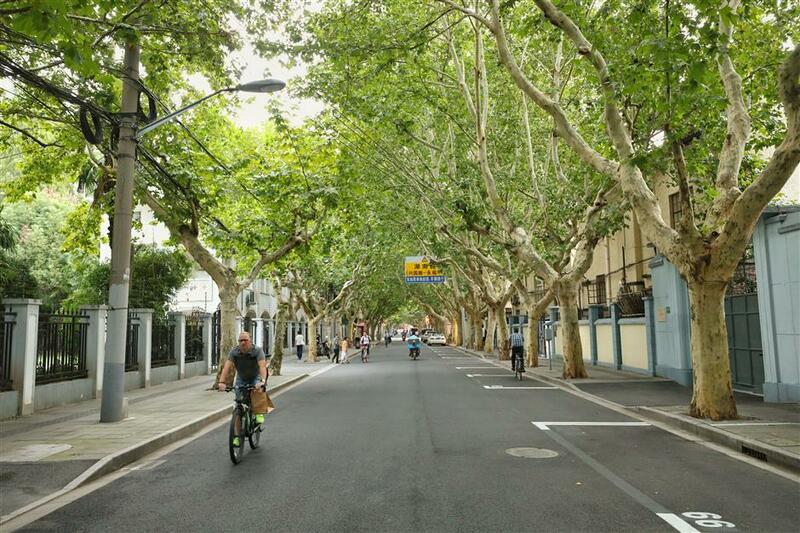 A road flood prevention program involving 11 street sections in six districts, Huangpu, Jing’an, Hongkou, Putuo, Yangpu and Baoshan, was also completed in 2018. For Han Meifeng, who lives in the Xibu Mingdi residential complex in Putuo District, going to the Ganbei wet market just five minutes walk from her home was once a tough job. The intersection of Xincun Road and Xixiang Road would flood with it rained heavily. To solve the problem pipes with a diameter of 1,200 millimeters replaced pipes with a diameter of 600 to 800 millimeters. “Even in typhoon days, the road is no longer flooded,” said Han. A total of 3,374 stations to collect recyclable resources were built in the city in 2018, exceeding the goal of 2,000. They combine waste sorting, green account redemption, renewable resource collection and environmental protection promotion functions. 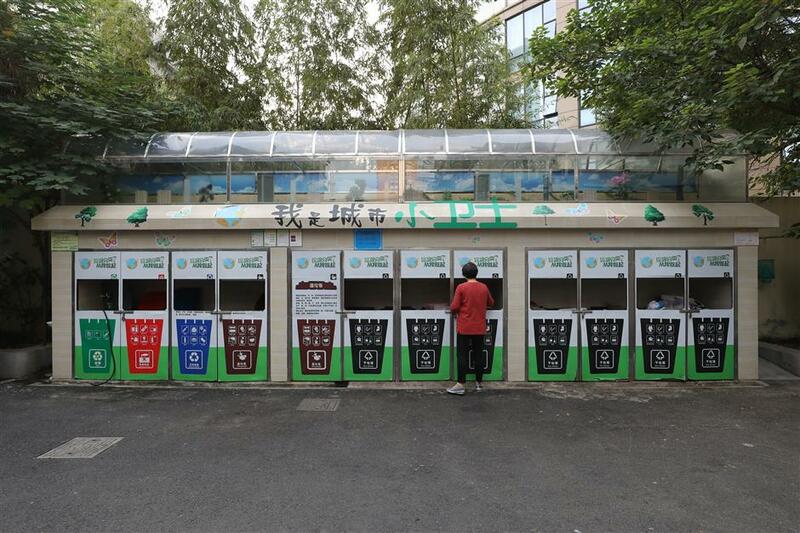 In addition, 575 community-based intelligent wet markets which feature automatic food vending machines and lockers were established last year, surpassing the target of 500 and bringing the total number of such wet markets to 1,475, serving nearly 1 million households. More than 55,000 licensed domestic helpers in the city were trained in 2018. The target was 40,000. In 2018, authorities eliminated 54 traffic congestion sites, created 159 shared parking projects and allowed people to handle 27 traffic affairs via mobile phone applications. In 2018, the city’s public security bureau carried out a spate of measures including adding vehicle lanes and optimizing traffic signs to eliminate traffic jams in 54 roads. Another major traffic problem is lack of parking spaces, especially severe in residential complexes, hospitals and schools. The government has integrated resources and made parking spaces available that are shared during working hours. In 2018, authorities created 5,500 “WeChat police stations” and installed 118 smart safety check devices. They added or upgraded freighting devices in 100 government-built apartment buildings and 80 old residential complexes. Seven emergency medical stations were built. Vertical greenery totaling 404,000 square meters was added, and 223.9 kilometers of greenway were constructed last year, compared with the goal of 200 kilometers. The greenery was mainly added at public buildings of working units, schools and hospitals, the bureau said. The 223.9 kilometers of new greenway was based on riverside developments, ecological corridors and countryside parks. The Huangpu River greenway, also known as the No.1 municipal greenway is mainly located along the Expo site. It stretches 4 kilometers and comprises walking, jogging and cycling tracks. It was created to give residents and visitors a natural respite from the city’s glass and steel environment, the Huangpu District Greenery Management Station said. A nearby resident surnamed Zhu, 63, jogs along the greenway for at least 5 kilometers every day. In 2018, 89 jogging and walking paths were built in parks, green lands and residential complexes. Construction and renovation of 72 sports fields and 342 community-based sports sites was completed. The tourist service center at the Bund. More than 5,100 standardized cultural activity centers were upgraded in 2018, exceeding the target of 4,500. In addition, 22 comprehensive tourist service centers were upgraded last year, compared with the goal of 20. The comprehensive tourist service centers have Wifi, recharge, wheelchair rental and AED equipment (automated external defibrillator) and ticketing services. They are mainly located in areas along both banks of the Huangpu River, countryside parks, tourist resorts as well as stations, piers and airports.